This past August long weekend was packed with shows and festivals across North America, some of you were adventurous enough to travel to the windy city for Lollapalooza or to Montreal for Osheaga, as for me, I stayed right in Toronto and attended Veld Music Festival 2015. Summer 2015 in Ontario so far has not been the best for rain on important weekends, especially for electronic music festivals. These crowds are usually pretty content to dance their hearts out in some rain, however, this summer has had some killer storms. Ever After Music Festival in Kitchener, Ontario continued the live sets but the rain was in full force that weekend resulting in poncho-wearing-ravers. Digital Dreams in Toronto, which has received unreal reviews in the past, ended up having to be shut down due to high winds and incoming storms, although it did result in refunds. 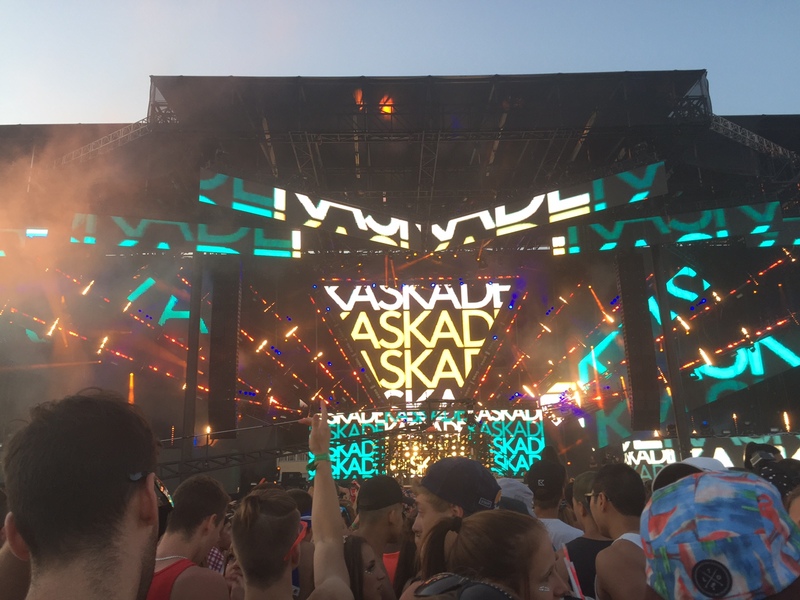 EDM fans had much of the same experiences this weekend at Veld Music Festival which took place in Downsview Park. The first day almost went off without a hitch until around 3:50 PM the festival shut down the music and advised attendees to wait until they decided if the weather was going to be okay. They had spotted some lightning in the area and wanted to take precaution in case the weather were to worsen overhead. Until then at least seven artists were able to play their sets. Markus Shulz and Pretty Lights were not able to due to the timeout. Many announcements came on that they would be holding out for another fifteen minutes, which occurred until 5:30 PM when Nicky Romero finally took the main stage. 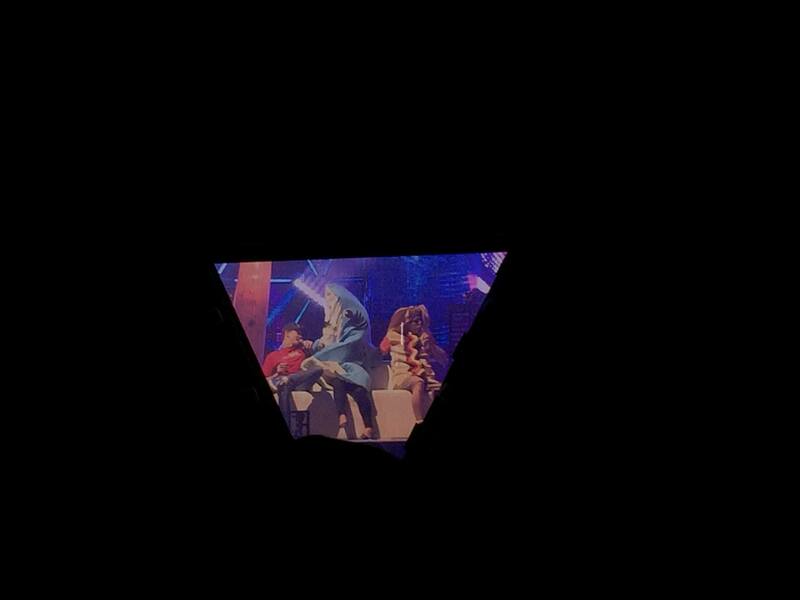 the result of Day 1 was that not everyone got to see the artists they came out for. Personally, the sets between 5:30 and 11:00 PM still made the day worth it for me as these artists killed it. Steve Aoki dropped the Titatnic theme”My Heart Will Go On” which made many audience members stop moving for a moment but then everyone around me, including myself and my friends began the belt out every word. I may be biased however, Kaskade killed it and I love seeing him play with the sunset over the crowd. Another highlight for Day 1 was that Deadmau5 brought up his brother in a hot dog costume as well as left shark from the super bowl, not only this but his set closed off the day with myself feeling quite content. You can check out his antics HERE. Day 2 began early with not a cloud in the sky, I got to see Dzeko and Torres, Chocolate Puma and Oliver Heldens. 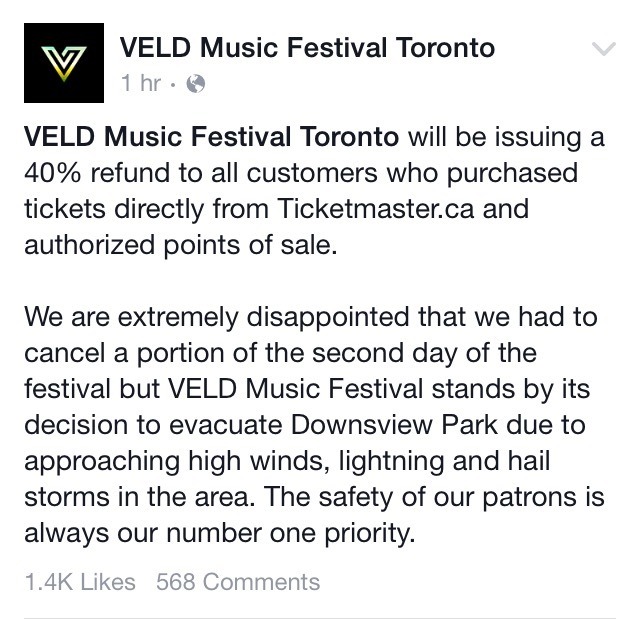 Just after that last set Veld had announced that they must evacuate the festival grounds as risks of strong thunderstorms were in the area. Most people exited in an orderly fashion, however, some people decided to show their disappointment by throwing rocks at security guards and the stage. One festival goer even set off a firework at the stage, which luckily did not end badly. The mass exodus resulted in packed buses and subways as everyone scrambled to get home before the storm really hit. The evacuation was for a good reason as the lightning that came with it was unlike anything I had ever seen. Many disgruntled fans have ranted on social media at how unrealistic and unfair the evacuation was, which I only partially understand. It is a great deal of money lose out on as well as great headliners such as Above & Beyond and Hardwell, however, they only do it for your safety. THIS is what happens to stages in dangerous storms! As of right now, nothing has been guaranteed as far as refunds go. Although I did not get to experience the festival to it’s full capacity I have had fun in past years and I can confidently say that I had fun this year as well with what I did get to see. EDIT: Veld organizers have announced that those who have purchased tickets through Ticketmaster.ca will be refunded 40%!